Mayor Bill de Blasio defended his record on homelessness and enforcing order Tuesday, saying that the issue is "both a perception and a reality problem." NEW YORK CITY — The city is not headed back to the "bad old days" of high crime and lawlessness despite recent controversies over an increased homeless population and aggressive panhandlers in Times Square, Mayor Bill de Blasio said Tuesday. "We've got to end this madness of talking about the bad old days," the mayor said during an appearance on the Brian Lehrer Show. "They're gone, they're over." The number of homeless people in shelters is 56,000, down from a 59,000 record high in December. There were 53,000 people in shelter when Mayor Michael Bloomberg left office. 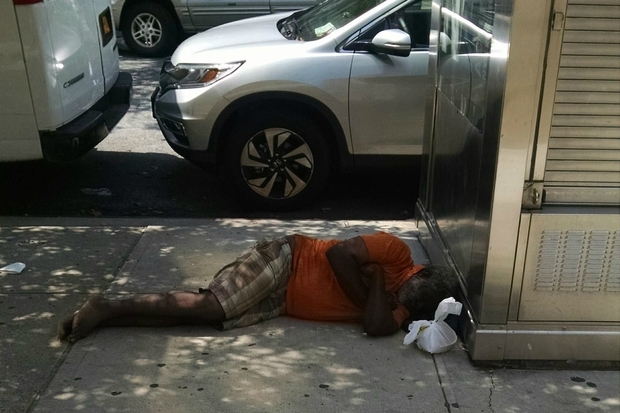 Calls to 311 about the homeless have also jumped 60 percent during de Blasio's 20 months in office. "The difference today versus, say 10 or 15 years ago, is that many more people are homeless for economic reasons," de Blasio said. "They literally cannot afford the cost of housing in this city. The wages that they have made don't keep up with the cost of living." He acknowledged that, "Yes, there is something real going on here," but added that "it is much more an economic problem than its being acknowledged to be." The mayor placed the blame for the spike in homelessness on a "huge policy mistake" by the Bloomberg administration to cut a rental subsidy program that kept people in their homes. "We realized there's a lot of folks who if they had a subsidy would not be in shelter," de Blasio said in explaining his new $10 million initiative to provide rental subsidies. Still, de Blasio made it clear that he would not tolerate homeless people who break the law. He also said that he would not allow homeless encampments. "I am very devoted to addressing issues of public order," he said. "That's why I believe in the Broken Windows strategy of policing. That's why I believe in addressing all quality of life offenses whether they are committed by a homeless person or anyone else." Advocates for the homeless said de Blasio was sending "mixed messages" with, on the one hand, his support of Broken Windows policing, where minor crimes are enforced to prevent more serious ones, and calls for compassion for the homeless on the other. "Disproportionately, Broken Windows is aimed at the homeless population," said Jean Rice, a board member of the advocacy group Picture the Homeless. "If affordable housing was accessible you wouldn't find homeless people urinating in the street. If affordable housing was accessible, you wouldn't find undomiciled people walking around drinking alcohol," he added. "These politicians are just playing politics with the lives of people who fell between the cracks." The mayor said he saw no contradiction. "There is no inconsistency between saying that these are human beings who in many cases need our help either for economic reasons or mental health or substance abuse reasons and we will provide that help to the very best of our ability," he said, "but at the same time we're not going to tolerate disorder."